The success of community action by rural people in the Brazilian Amazon offers hope for the conservation of freshwater turtles and other aquatic species. But who will now guard the guardians, and ensure the long-term continuation of their valuable work? Our recent article  in Nature Sustainability presents a rare example of optimism in Amazonian conservation in the form of community-based management. The engagement of local stakeholders is a key element in any successful conservation initiative and yet, the vital contribution of rural communities is perhaps often over-shadowed in public minds compared to the role of international conservation programmes and organisations. During our long-term research activities in the mid-Juruá region of western Brazilian Amazonia, we have worked in close partnership with resident’s associations and co-operatives, municipal councils, and regional universities. Under the banner of our collaborative project called Projeto Médio Juruá, a team of Brazilian and international students and researchers have spent the last 12 years working on ecological and social aspects of life in the floodplain forests along the margin of the Juruá River. Throughout this period, we have been impressed by the organisation, enthusiasm and dedication of rural people from the region, living both inside and outside formally protected areas, in working to conserve the biodiversity and natural resources of their environment. 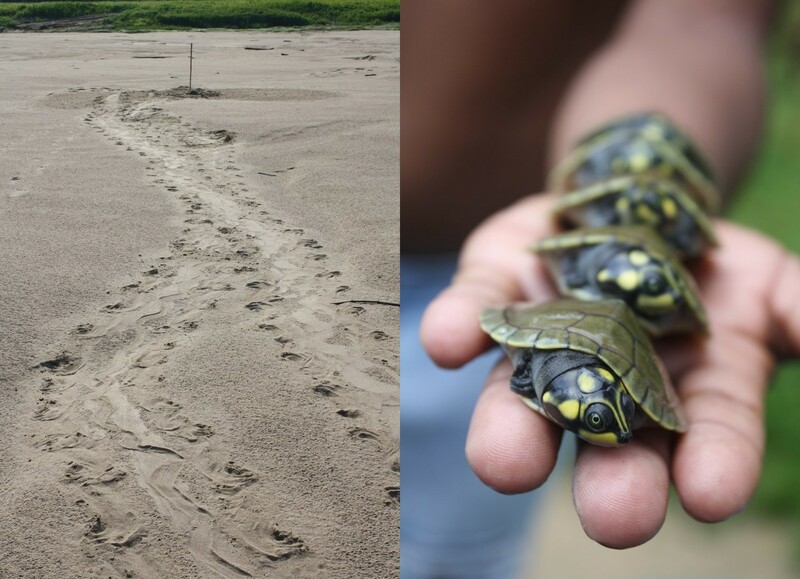 The efforts of these people to protect beaches along the river that are used as nesting sites by freshwater turtles is just one such impressive example. We were particularly motivated to tell the story of this action for two main reasons. Firstly, in addition to long-term data on the population trends for turtle species, we had also noticed the remarkable contrast between protected and unprotected beaches for non-target taxa including birds. Providing a rigorous multi-taxa assessment of these collateral conservation benefits became the focus of our paper. Collateral conservation benefits of protected beaches (left) versus unprotected beaches (right). Illustrations: Karla Koehler. Our second objective was to tell the more personal account of the people devoting their time and effort to this cause. Both before and during fieldwork for this project, we had collectively spent many hours, in local villages, at association meetings and in the rustic shelters overlooking protected beaches, discussing with beach monitors their motivation and the challenges that they perceived. In our study area, beach protection started during the period of rubber exploitation in 1977, with only three protected beaches, expanding to the 14 today that local communities maintain in partnership with community associations, and Brazilian governmental agencies and universities. The Pé-de-Pincha project has successfully supported the capacity building of local monitors to conduct daily monitoring during the breeding season of oviposition, female body size, number of hatchlings emerging from nests, and poaching rates. Illegal commerce pressure on freshwater turtles in the region remains high, and beach guards are often confronted by poachers attempting to harvest eggs and egg-laying females on the beach. In the absence of any training in conflict resolution or self-defence, their safety is often placed at risk from armed poachers. This only adds to the physical hardship typically endured in carrying out their duties, which involves a prolonged existence away from their village in isolated and basic conditions. Beach guards survey their protected beaches along the Juruá River in the western Brazilian Amazon. Photos: Joseph Hawes. The dominant opinion voiced by beach guards is that, despite these hardships and the conservation success that they are delivering, their contribution is not adequately valued at present. Paid only in a food hamper that often does not meet requirements, discontent is growing and many are on the verge of neglecting services often continued until now only through the perceived moral obligation towards the parents and grandparents who had protected the beaches before them. It ultimately comes down to respect, and a relatively small and cost-effective investment would go a long way to demonstrating the appreciation necessary to boost the morale of beach guards and support the continued conservation success of this community driven programme. To further highlight the potential of this approach, we have also recently produced a conservation handbook , outlining the history of turtle exploitation in the Amazon, and describing the practical steps taken by rural communities in the Médio Juruá to implement beach protection. Published in Portuguese as well as English, this handbook is currently being distributed to interested communities and reserve managers throughout the Brazilian Amazon by the Fundação Amazonas Sustentável (Amazonas Sustainable Foundation), to encourage and support the people who are working to protect turtles and other Amazonian biodiversity for future generations. Tracks from a female turtle nesting on a protected beach and a beach guard with turtle hatchlings. Photos: Joseph Hawes.